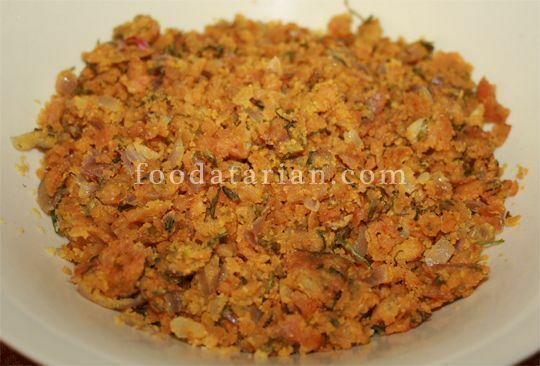 ‘Zunka’ is a Maharashtrian recipe made out of gram flour. It has few ingredients and is delicious if made little spicy. It is also called as a poor man or a farmer’s food. Tastes best if served with ‘Bhakri’, onion and ‘Mirchi Thecha’. You can also have it with plain roti or dal-rice. It can be a replacement of vegetable or as a side dish. There are different methods of making zunka, but this one is with minimum ingredients, yet tastes awesome. Heat oil in a heavy bottom kadhai. Meanwhile mix together all the other ingredients in a bowl and add little water to get a thick mixture (thicker than the batter of bhajiya). Mix properly and then drop it into the oil. Give it a nice stir and cover and cook over low-medium flame, stirring ocassionally until the mixture is dry. Once dry, uncover and cook mixing ocassionally until it turns golden brown in color. Serve with Bhakri (Bajra-Jowar Roti), raw onion and mirchi thecha (green chilli chutney).